In 1970, Paul Samuelson became the first American to win a Nobel Prize for Economics. Nobel officials cited him for rewriting considerable portions of economic theory, noting that his contributions ranged over many fields. One of his early books, Economics: An Introductory Analysis (1948), was a bestselling economics textbook, and its 18 editions have now sold more than 4 million copies. 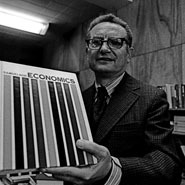 A towering figure in his field, Samuelson is noted for applying mathematical techniques to consumer theory, welfare economics, and international trade. He is one of the founders of neo-Keynesian economics, which argues that active government intervention in the marketplace and in fiscal policy is the best way to ensure economic wellbeing.